Peta Murgatroyd laughs at Brant Daugherty while walking in New York City on Tuesday morning (November 5). The Dancing With The Stars couple hit up Good Morning America and The View to say goodbye to their dancing days — for now. “This season has meant the world to me…I am so sad that I can’t show one more week of @brantdaugherty’s incredible talent…he has proved That a non dancer CAN make it far and I’ve been so privileged to watch America fall in love with him,” Peta tweeted last night after their elimination. Brant Daugherty and pro partner Peta Murgatroyd stop by Good Morning America the morning after their DWTS elimination in New York City on Tuesday (November 5). The dancing couple performed a Foxtrot set to guest judge Cher‘s “The Shoop Shoop Song (It’s in His Kiss)” and a dance off with Leah Remini and Tony Dovolani before exiting the ballroom. 'Dancing with the Stars' Week 8: Who Went Home? Sadly, one of our favorite contestants was sent packing during the Monday night (November 4) episode of Dancing with the Stars. 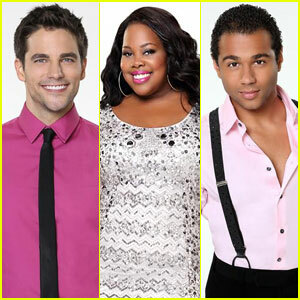 Amber Riley and her partner Derek Hough took on the Rumba, while Brant Daugherty and Peta Murgatroyd danced the Foxtrot. As for Corbin Bleu and Karina Smirnoff, they rocked the Argentine Tango. So who was eliminated by America’s vote on DWTS tonight? Brant Daugherty: 'Tuesday Mornings Are Stressful'! Brant Daughtery and Peta Murgatroyd arrive at almost the same time for “Dancing With the Stars” practice on Sunday afternoon (November 3) in Los Angeles. The two partners hit up the studio to finish off their Foxtrot, which they’ll be performing later tonight. Be sure to catch an all-new Dancing With The Stars on ABC @ 8PM ET/PT TONIGHT! Brant Daugherty flips the cameras on the paparazzi as he arrives for more dancing practice in Los Angeles on Saturday afternoon (November 2). “Studying the tapes. Always looking for things we can improve #DWTS,” the 28-year-old actor Instagrammed during rehearsal. “There are no days off. I haven’t had a day off since we started the show and neither has Brant. He’s been amazing. He’s so wanting to be in the studio. I don’t think I’ve had a partner who has been so immersed in this whole competition. He’s absolutely loving it and I love that about him,” pro partner Peta Murgatroyd told OK! mag about their dancing schedule. Brant Daugherty looks over his shoulder as he arrives at Dancing with the Stars rehearsal on Tuesday afternoon (October 29) in Hollywood. The 28-year-old actor was soon followed by his partner Peta Mugatroyd.